Tired Green, Full Fruits . . .
Conrad never holds back in conversation. As a poet, he values each spoken word. He noted that poetic phrase of mine, which I have been savoring in my mind ever since. By doing so, I have been practicing one of the techniques that has become synonymous with Conrad’s writing process. He calls it (Soma)tic Poetics: exercises involving the poet suffusing his or her self with a singular theme for a set period of time. These exercises can take various forms such as eating only orange foods, or wearing only blue clothes. 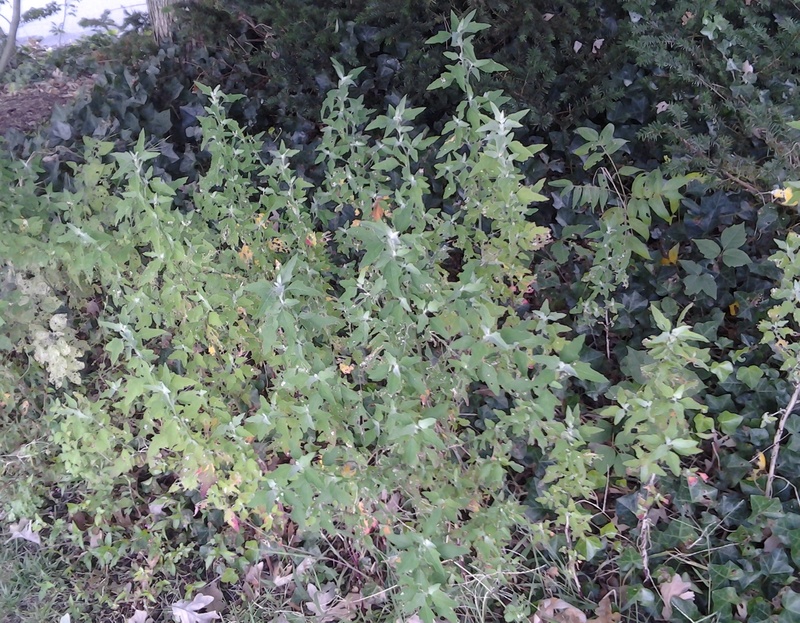 For me, I began contemplating tired green foliage, to see what insights the plants’ form and color might reveal. My use of the word tired stems from the physical wear and tear a plant undergoes during the hot sun and scattered thunderstorms of summer. Native and immigrant urban wildflowers have to endure even more stress and the color, the tired green of late September, reveals that to my eyes. The bright lime and avocado shades of May transform into a grayish pallor that also shows the underlying yellows, often edged in brown. Though not yet ready to burst into color and fall, the near future season of transition for the leaves is visible. Some hardier species do remain in bloom. 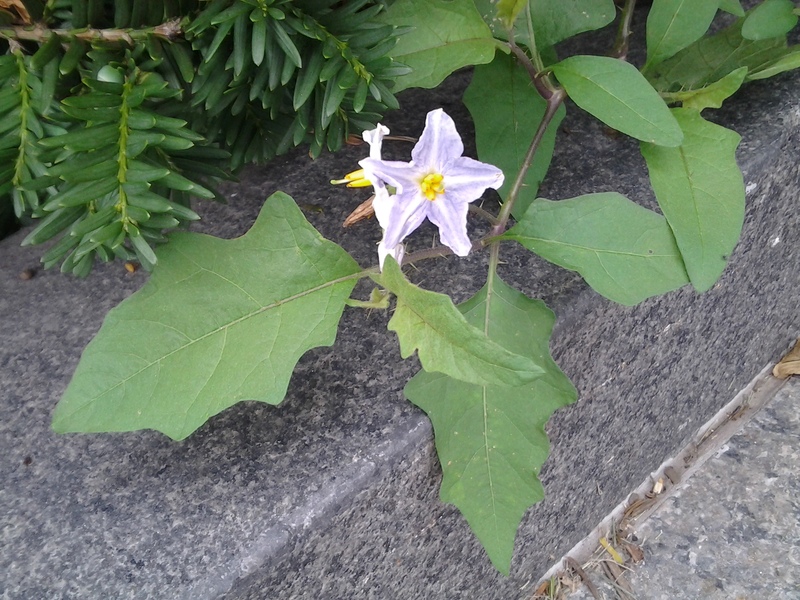 One that sports showy white petals above its aging leaves this time of year is Horsenettle (Solanum carolinense). Tired the green may be, but there are still fresh, colorful wildflowers to be found throughout the urban landscape. My wife and I visited the annual Medieval Festival in Fort Tryon Park on the last Sunday of September. 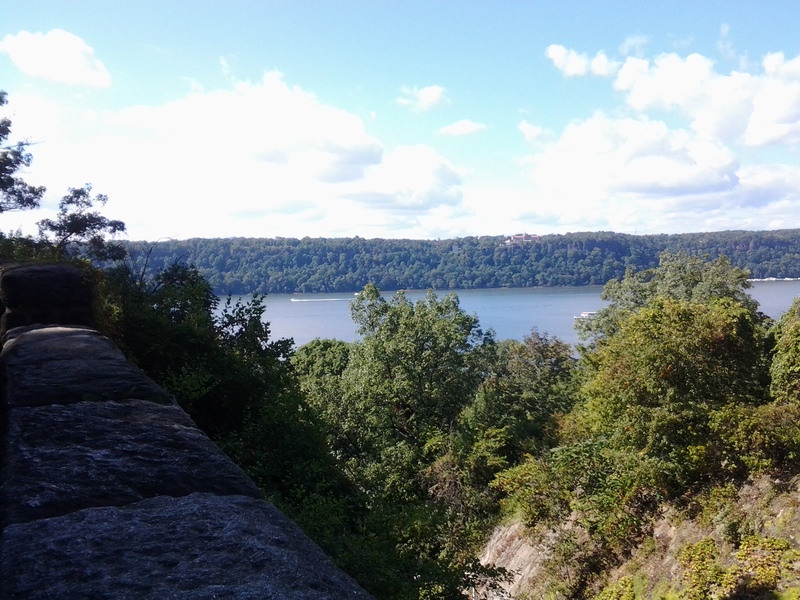 Located on the far upper west side of Manhattan, this park sits on a high bluff overlooking the Hudson River and the Palisades, which form a true fjord. The views are breathtaking and wild, hard to associate with the conventional image of Manhattan, although the park is located on the latitude of 190th Street. 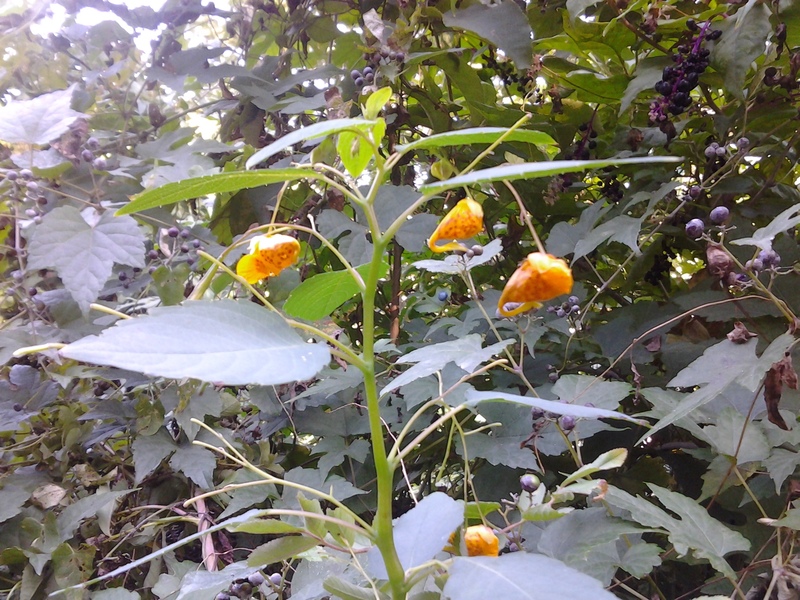 Flanking the paths of Fort Tryon Park we discovered a variety of late wildflowers such as Asters and Jewelweed (Impatiens capensis). Prevalent, too, were the fruits of many species, such as the Common Nightshade (Solanum ptychanthum), its stems supporting what look like tiny black tomatoes. 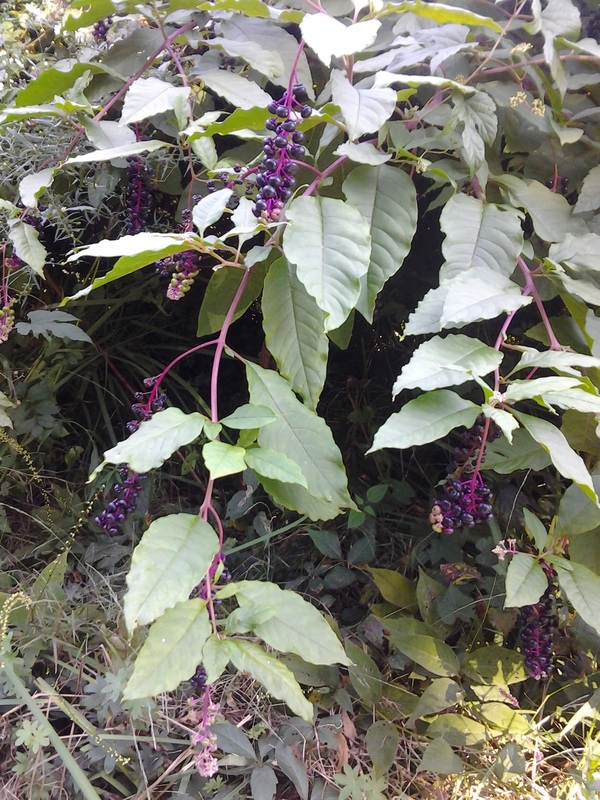 Most vivid of all was Common Pokeweed (Phytolacca americana). A patch of these plants resembled a wildflower vineyard lush with thick drooping clusters of burgundy and purple berries. A sign this summer, now retired, cultivated an excellent growing season. You can learn more about poet CA Conrad by visiting his own blog (and purchasing and reading his masterpiece, The Book of Frank). Click on his name under the Blogroll . . .